Peanut butter isn’t just for school lunches. This versatile spread is surprisingly good for your health. The high protein and healthy oils help with weight loss, diabetes and even Alzheimer’s disease. For those of you who are not getting enough “healthy fats” in your diet, the fat in peanut butter is heart-healthy monounsaturated fat. Interestingly, a study found that insulin-resistant adults who ate a diet high in mono-saturated fat had less belly fat than people who ate more carbohydrates or saturated fat. When it comes to peanut butter, I have pretty good self-control except for when it comes to this new spread. Checkout why this peanut butter is my new favourite food addiction! 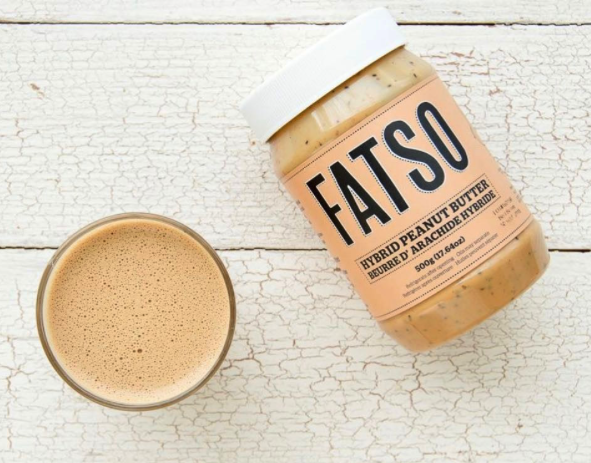 Fatso Hybrid Peanut Butter is an all-natural peanut butter hybridized with “superfats” such as coconut oil, avocado oil, MCT oil, macadamia oil, chia, flax and the natural sweetness of tapioca starch which acts as a prebiotic fibre. Eating foods that are high in fatty acids improves blood cholesterol levels, which can lower your risk of heart disease. So why peanut butter? Essential fatty acids are the fats that are essential for growth development and cell functions, but cannot be made by our body’s processes. Our bodies use the fat we consume and the fats we make from other nutrients in our body to provide energy for many of the functions we carry out in our daily life. Wanting to improve your brain health? Saturated fat is one of the main components for brain cells and is necessary for healthy brain function. Finally, healthy fat helps to maintain healthy skin and tissues. All of our cells need to contain some fats. So try adding a good quality peanut butter to smoothies, blending it into your morning cereal, or eating it straight out of the jar with your spoon! As the founder of Vancouver Health Coach, Suzanne brings a unique blend of experience gained working in the health industry for over 20 years. Her health coaching offers an individualized process to help her clients move forward with a healthier and more balanced life. As a Pioneer in the field of health coaching, Suzanne believes every individual requires support, knowledge, and compassion to achieve great health and wellness.